as much as i love to travel...sometimes i just want to be home and that's exactly what i did this weekend. the weather was a bit gloomy & rainy which gave me the perfect excuse to stay in with a few exceptions to go catch up with friends for a few hours or run out to get food. so, with the weekend involving very minimal activity that meant minimal makeup, hair and outfit! i think it's easiest to go minimal, but make it look like you took the time to getting ready by adding a splash of color. so, i went pink on the lips, nails and my jeans. i wear pink makeup (blush, lip gloss, nail polish); clothing wise i don't really wear pink. but...with spring officially here i thought it was the perfect excuse to sport my rose 1969 lightweight always skinny cropped jeans i recently got from gap. have you ditched your black and blue jeans for spring? I got the pink and gray ones!~ :) So cute. oh nice! i may grab some of the other colors..if they are still available! Love the relaxed look on you Jin. I have to try out some colors this spring. Cute wallet!!!! Ok, lady, you've been looking really good lately. 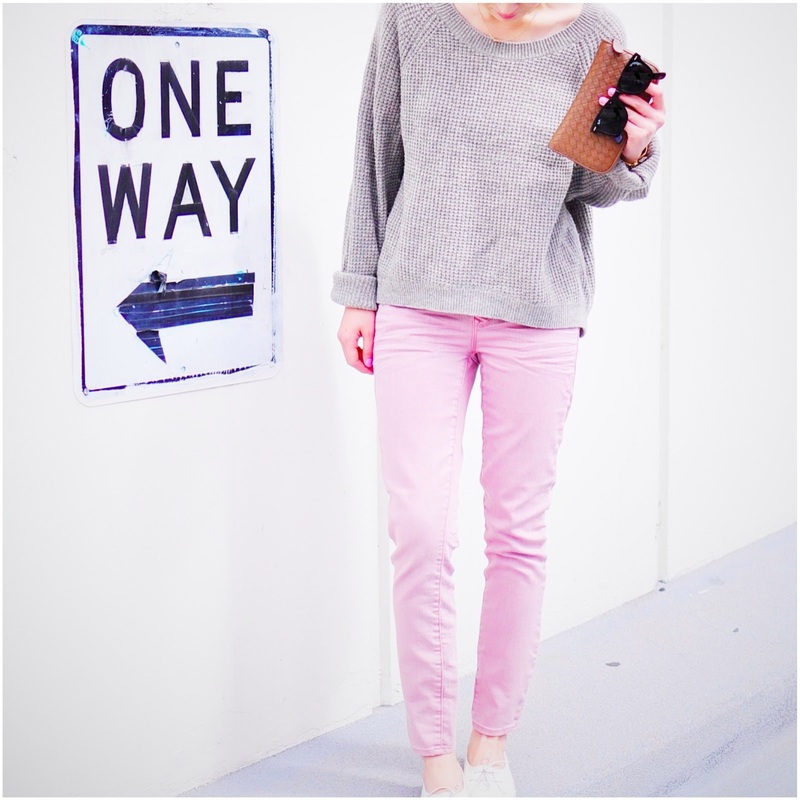 Loving the lilac jeans and your photography. Who's taking your photo? The title of this post, Cozy Pink, perfectly describes this outfit. It's making me think I need to give Gap jeans another try. (They never fit me the way I like.) It also sounds like they have some fun colors for spring. Another great look! I love your lilac pants, so cute! I just bought a pair of pink jeans and hoping to wear it when the weather's nicer. i LOVE that Vince sweater, so fashionable yet comfortable. the perfect outfit! !